"My number one priority is ending the stuffiness”. 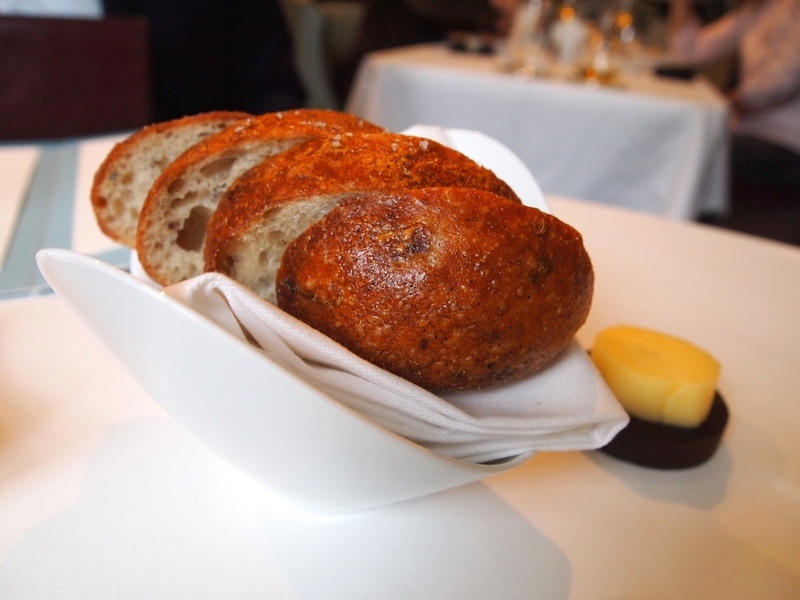 With those words Marcus Wareing announced in January this year that he would be temporarily closing his eponymous two-star restaurant at the Berkeley Hotel in London for refurbishment and that the restaurant would relaunch as the less formal 'Marcus'. 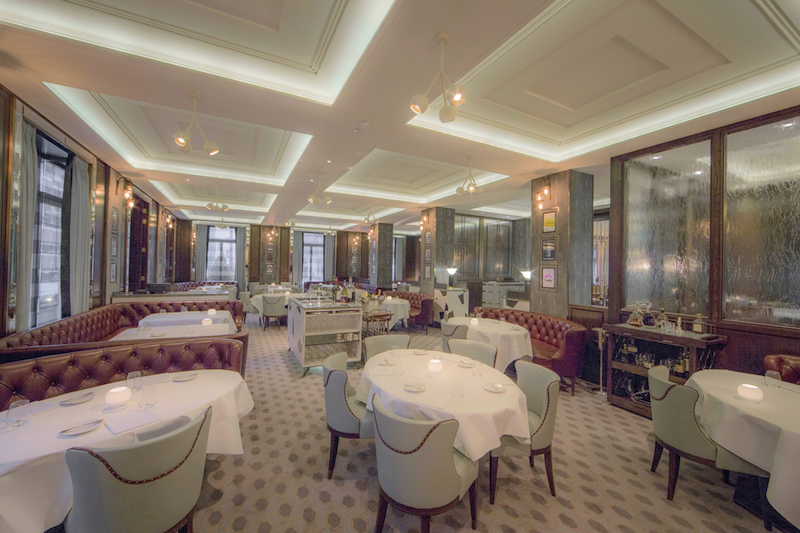 Three months and £1.4 million later, the restaurant has shed its old Petrus skin (and the concomitant dark and burgundy colour scheme) and now has a modern and bright dining room with a lighter colour scheme. 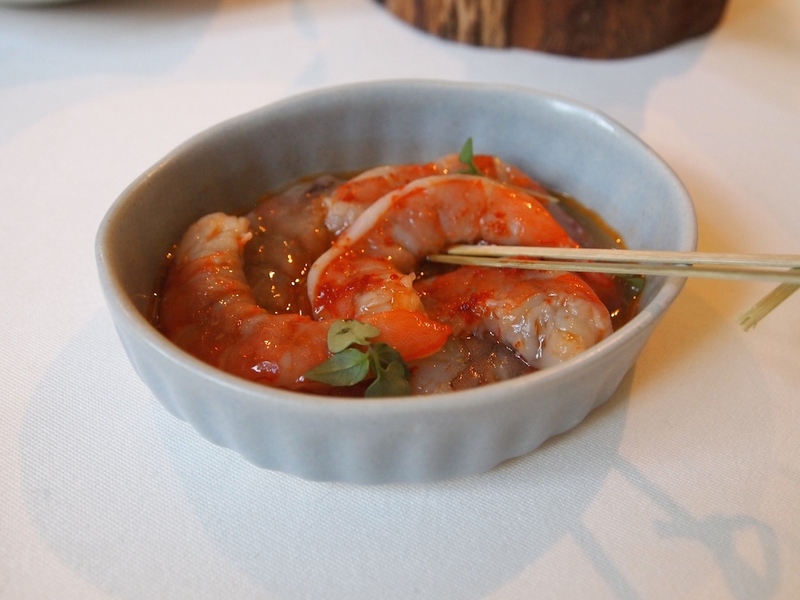 Where the old Marcus Wareing was very much about old school fine dining (which I liked very much), the new Marcus offers a more relaxed dining experience with excellent but less ceremonious service. Marcus is open for lunch and dinner Monday till Saturday and you can choose between an a la carte menu (2 courses £60, 3 courses £85 and 4 courses £95), an 8-course tasting menu (£120) and there's a separate (and attractively priced) lunch menu with a choice of tasting plates (£6 - £10), starters ( £11), mains (£19) and desserts (£8). 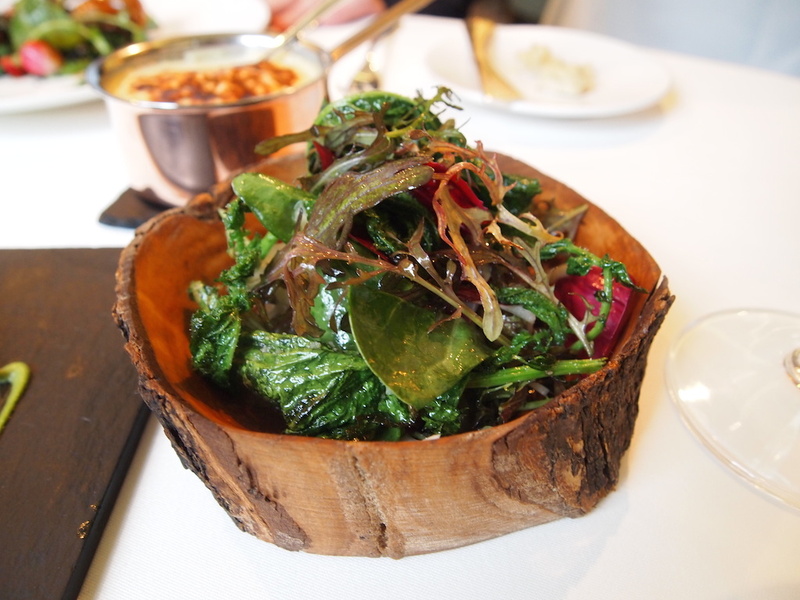 I had lunch at Marcus with my husband and a friend on Saturday 19 April 2014 and we all selected dishes from the lunch menu and the a la carte menu. 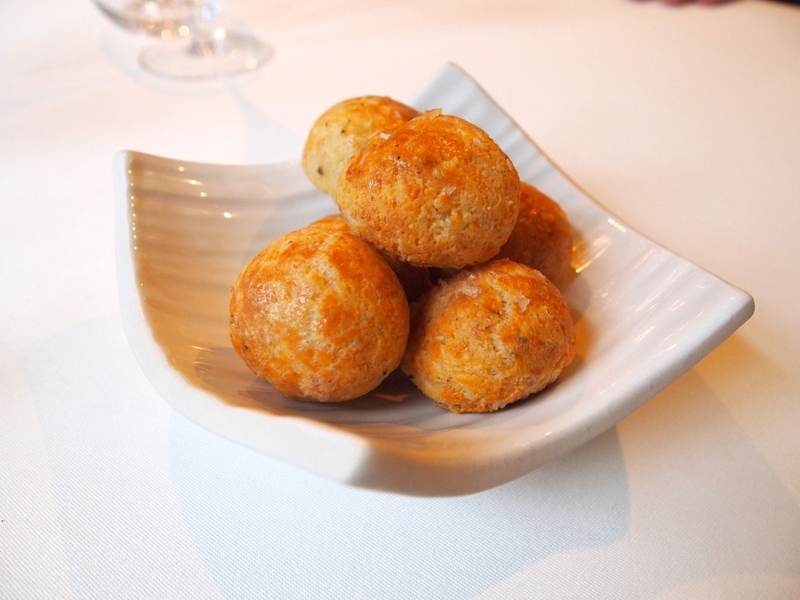 With our aperitifs we were served some delicious, golden and buttery cheese gougeres, followed by some soft and warm fennel bread. 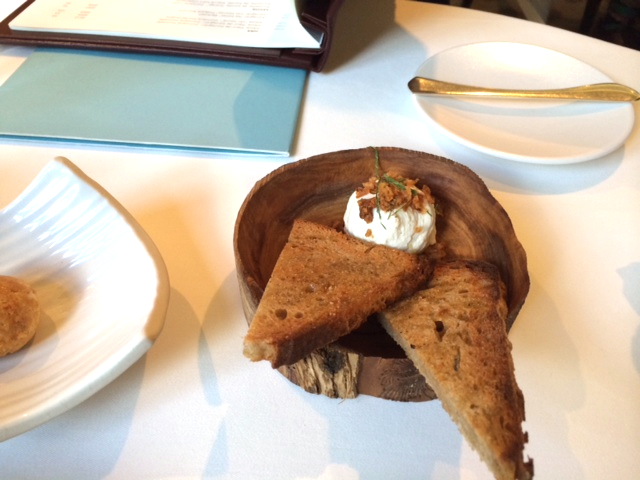 Next to arrive were three 'tasting plates' from the lunch menu, shared between the three of us. Juicy, marinated prawns, the marinating juices having a nice touch of aniseed - a feather-light foie gras espuma and salty-sweet bacon jam, served with buttery, toasted brioche - fresh goat's curd, sprinkled with crunchy shallots and served with toasted sourdough. 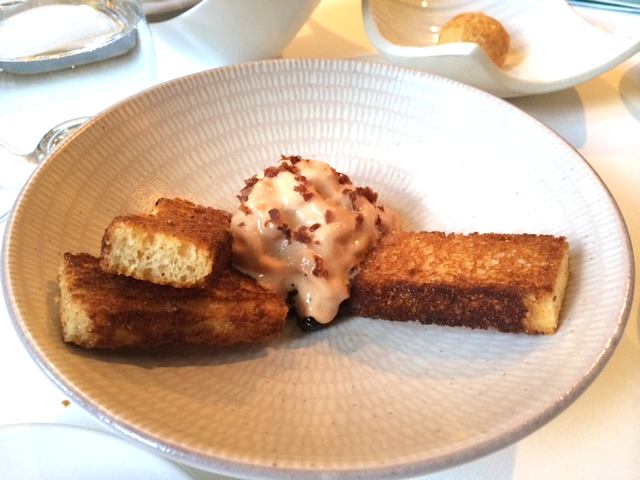 Three delicious plates with wonderful flavours and textures, the foie gras and bacon jam being particularly moreish. 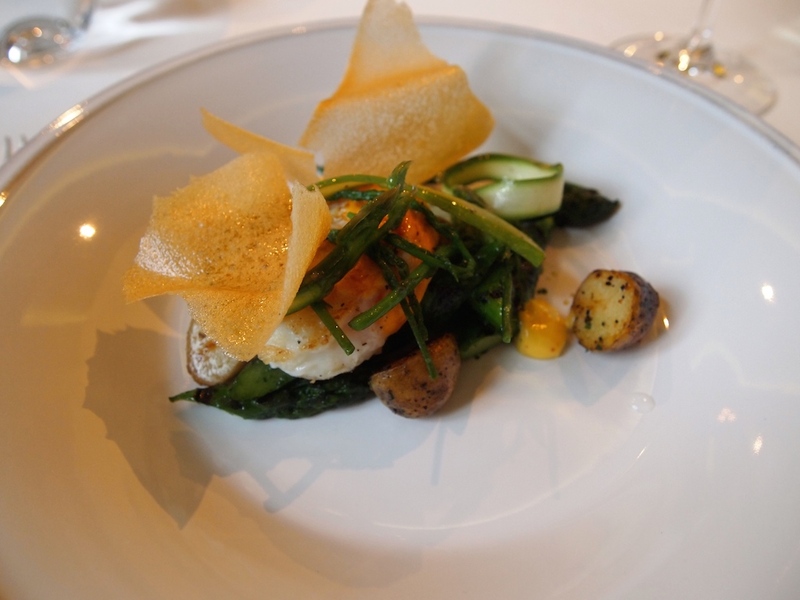 My starter was a very pleasing combination of grilled green asparagus, a soft hen's egg (slow poached at 58°C, then caramelised on the plancha), asparagus shavings, pan-fried Jersey Royals, aioli, and a potato crisp made from dehydrated and then deep-fried potato mash. A successful marriage of great flavours and textures and the oily and garlicky character of the aioli complemented the natural flavour of the asparagus and Jersey Royals wonderfully. Even better was the superbly cooked turbot, that had fantastic caramelisation on the outside and was tender and juicy on the inside. 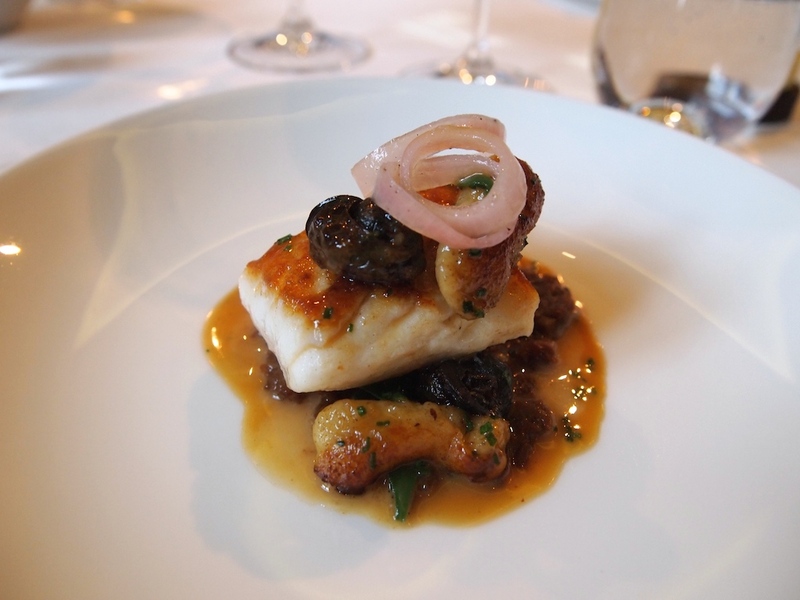 With the turbot came some well-cooked, tender snails, fluffy potato gnocchi that completely dissolved in the mouth, and a gorgeous, concentrated turbot jus. Hidden underneath the turbot were some soft and sweet braised shallots, that had a lovely hint of bitterness. On top of the turbot were some pickled shallots, delivering sharpness and a little mustardy kick from the pickling spices. A well-constructed dish with impeccable flavours, the acidity of the pickled shallots balancing the rich flavours perfectly. My main course was Middle White pork (to share). 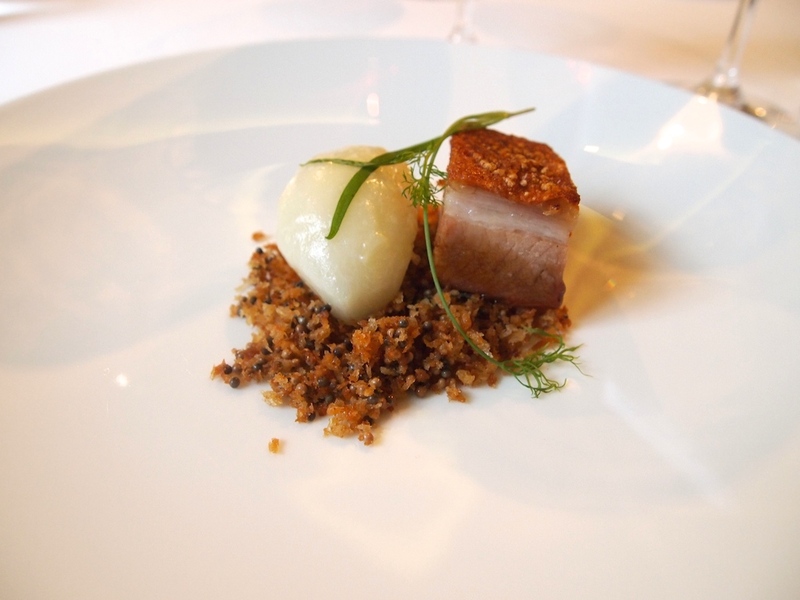 A beautiful piece of pork leg with a nice, meltingly soft layer of fat and crisp skin, served on top of a wonderful mixture of crunchy and buttery breadcrumbs, toasted black mustard seeds, sage on onion, and chaperoned by a classically 'turned', delicious turnip. Subsequently we were served a true pork bonanza, consisting of a piece of succulent pork belly, a piece of tender pork fillet, covered in herbs, a juicy pork chop, a piece of wonderfully moist and pink shoulder, and an intensely flavoured pork jus reduction. Also on the 'slate' was some caramelised fennel, fennel puree, pickled shallots and a lovely sweet and floral glazed apple. A mixed salad with crunchy, pickled white cabbage and heart-stoppingly rich potato mash mixed with Lincolnshire poacher, were served on the side. 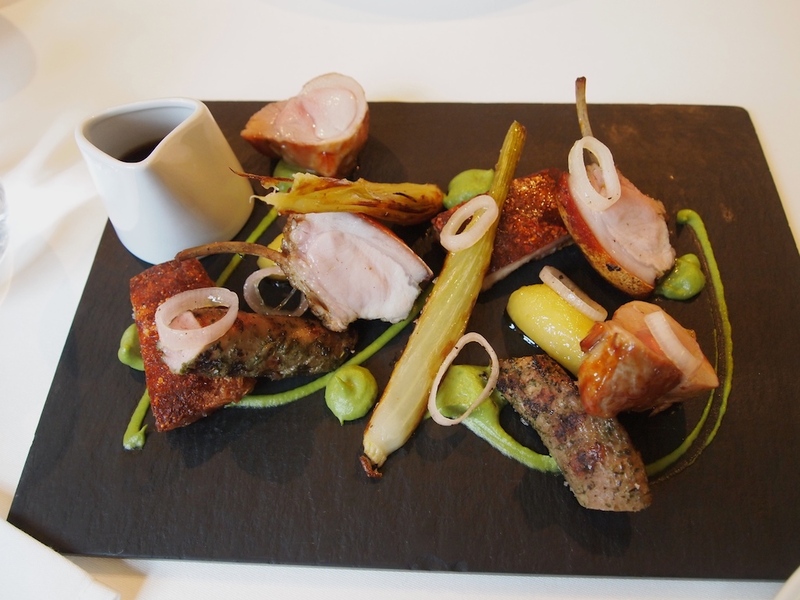 A hearty but surprisingly refined dish and getting all the different cuts of pork on the plate with the perfect cuisson is no mean feat. Loved the different flavour intensities and textures of pork and the turnip, apple and fennel provided a nice flavour contrast. Dessert was a perfectly cut slice of mascarpone, blood orange and streusel tart, served with a few dots of blood orange gel and a nice and refreshing milk ice cream. 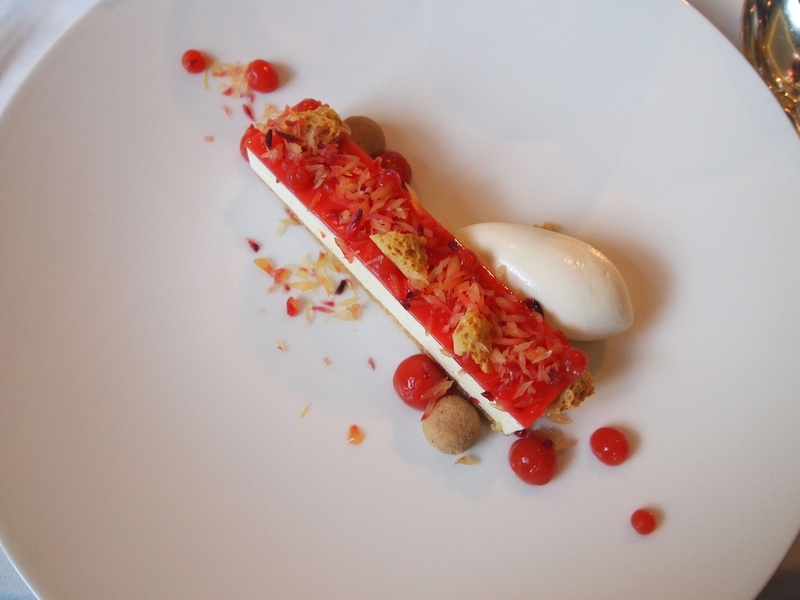 The tart had a nice, crumbly, biscuit base, followed by a creamy layer of mascarpone, mildly flavoured with lemon and blood orange, a thin layer of blood orange jelly, and finally a sprinkling of blood orange vesicles and streusel. A wonderfully sweet and tart dessert with lovely textural contrasts. Was the transformation of 'Marcus Wareing' into 'Marcus' successful? There are many aspects to the answer to this question. Are they incomparable or deep-down still the same? I liked the old decor and I certainly like the new decor - but this is slightly beside the point. 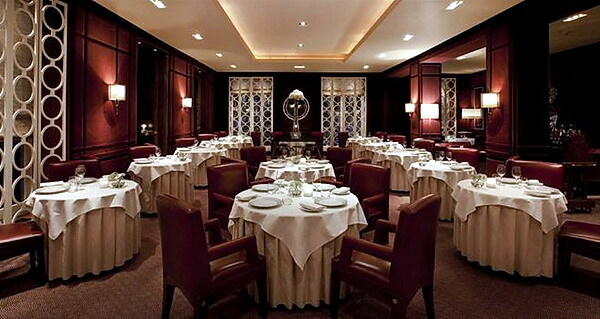 I am not an interior designer and I do not rate restaurants in that way. Is the service less stuffy? I am not sure that it was all that stuffy to begin with, but there still is linen on the tables, the waiters still do not wear jeans and they still do not address you with the remarkably concise and effective "Oi". The restaurant has not transformed into a bistro and the prices aren't exactly casual either, but the flexibility to have a less extensive or expensive meal has indeed improved. When you enter the restaurant you still have to pass through the purgatory of people having tea before ascending the steps that lead you onto the top of mount Marcus. On the other hand: even if the (in)famous Barclay bankers' £44,000 Pétrus meal in 2001 did not take place at these premises, any of its long shadows that might still have remained, have now been lifted. And the food, you ask? Good. Very good. Excellent. Marcus Wareing is a consummate professional who sources his ingredients carefully; the menu was focused and the execution very precise. 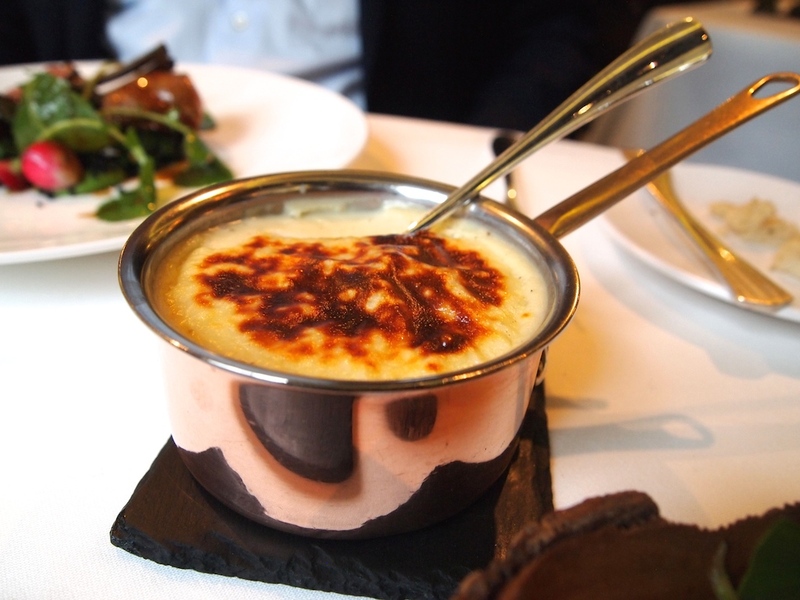 Marcus (Wareing) continues to guarantee a very consistent fine-dining experience in keeping with its lofty Knightsbridge location.